A Cairo court Saturday sentenced former Egyptian President Mohamed Morsi to death after he was convicted for a 2011 jailbreak. Sentenced with him were 100 other defendants including Muslim Brotherhood leader, Mohamed Badie, and a former parliament speaker, Mohamed Saad El-Katatny. The sentences were referred to the Grand Mufti for confirmation on June 1 before execution. 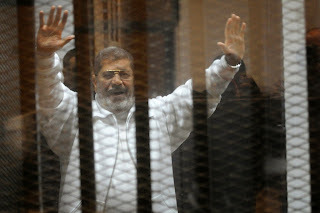 Morsi and his co-defendants were accused of collaborating with the Palestinian Islamist group Hamas and the Lebanese Shia group Hizballah in a mass jailbreak during the riots which overthrew President Hosni Mubarak.